It's September and the Halloween polish is starting to appear! Not gonna lie to you guys, Halloween is one of my favorite times of the year, so when I get to enjoy Halloween polish, too, it makes the season even better! This collection I'm sharing today is by SoFlaJo and it is called the Terrified Collection. We're starting off with my favorite of the bunch, Purple Reign of Terror. It's a gorgeous blackened purple jelly with heavy shimmer and holographic glitter. This swatch shows three coats. The fine electric shimmer really makes this polish stand out. 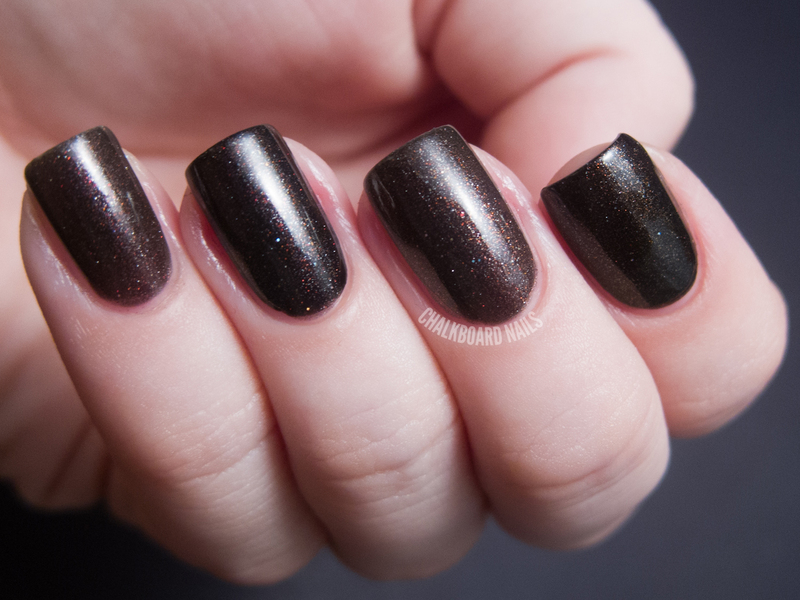 Spider Funk is a glitter polish that comes in a matte base! Can't say I've tried one of those before, all of the mattes I have are shimmers or cremes. It's clearly meant for Halloween with its orange and black colors, but the orange is kind of bronzey and I bet you could get away with wearing it outside of the season. I've shown two coats. 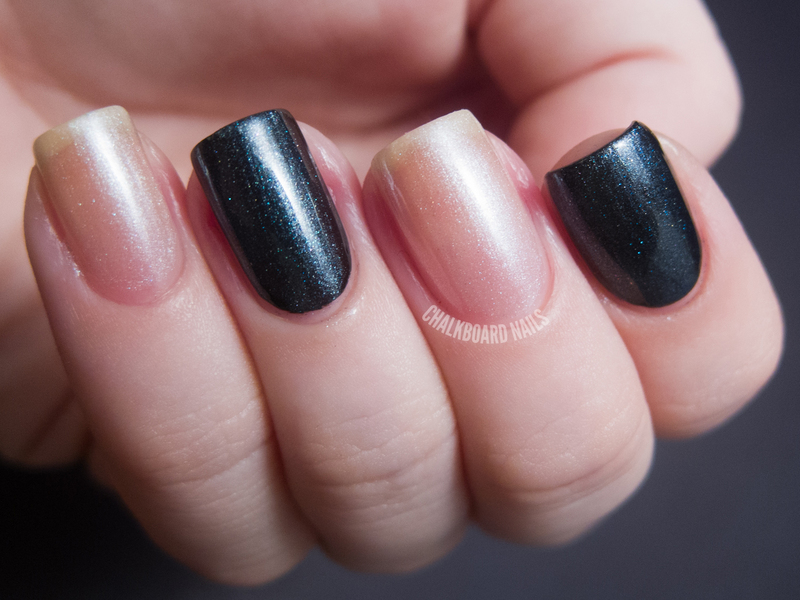 You can of course also add topcoat to give this manicure some gloss, if you prefer. The True Death is a browned red with lots of shimmer and flecky bits. I've shown three coats of it alone on my pinky and middle fingers, and one coat over black on my ring and pointer. It's a perfect fall shade and really unique. The True Death is also slightly duochromatic, and changes from it's reddish brown to an olive green at certain angles. This next polish is called Ghost of a Chance. It's a good name -- the polish is quite ghostly! It's also quite sheer. My pinky and middle fingers show three coats alone. However, it also takes on a new life when layered, turning blue and adding an extra dimension to the base it is over. I've shown one coat over black on my ring and pointer fingers. Frankie's Lab Dance is an iridescent green with orange, green, and purple microglitters. It looks great when layered over black (one coat on my ring and pointer fingers), but I actually prefer this one on its own! It's got kind of a zombie flesh greyed out green thing going on that I totally dig. My pinky and middle fingers show three coats of FLD alone. All in all, I think this is a fun and well balanced Halloween collection. Which one is your favorite? Are you in love with Purple Reign of Terror like I am? Spider Funk also stands out as a really neat Halloween creation, to me. SoFlaJo polishes are sold on SoFlaJo.com and on Etsy. You can also like SoFlaJo on Facebook to keep up with restock notices and other news. Purple Reign of Terror looks so pretty! Purple Reign of Terror looks like a galaxy in itself ! Purple Reign of Terror looks like galaxies! I do not like Halloween at all, but it does inspire many pretty polishes. Frankie's Lab dance is the most appealing to me.